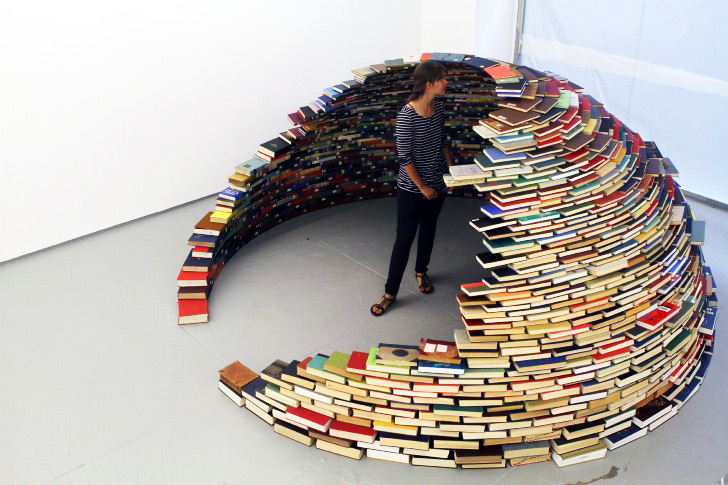 Artist Miler Lagos recently unveiled an incredible igloo made from hundreds of books! We've seen houses made of books before, but this unique domed construction was built with volumes taken from the library of a defunct US Navy base. The Colombian artist arranged the books in a neat dome to explore the dynamics between nature, culture, and material possessions. The books are arranged with the pages facing outwards to create a a white shell while the colorful spines of the books face inwards revealing their titles. From dictionaries to volumes on geography and psychology, the 9-foot space contains the wealth of knowledge held within the books. The playful structure thus provides both a protective shelter for its imagined residents and a space filled with information to be passed between generations. Lagos’ Igloo was on show at Chelsea’s Magnan Metz Gallery in New York as part of the larger exhibition back in October 2011. 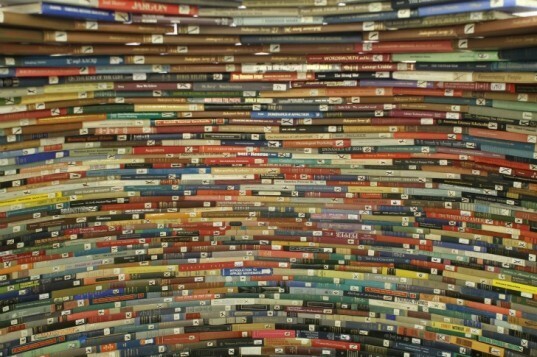 The books' colorful spines of the books face inwards revealing the titles of their contents. From dictionaries to geography volumes the 9-foot space thus contains the knowledge held within the books. It also presents a space filled with information to be passed between generations. The playful structure provides a protective shelter for its imagined residents. The books are arranged with the pages facing outwards to create a a white shell.